A crispy pastry consisting of hungreds of layers filled sweetened ricotta and semolina. This recipe was taken from an antique cook book given to me by Chef Antonio Cannavacciuolo who runs a 2 star Michelin restaurant at the Villa Crespi in Piedmonte, Italy. Roll out thin strips of the dough in the pasta machine. Make several equal strips in length of at least 40â. The strip should be the thickness of 1/16â or less. You will then have a coil of approximately 12â in length and 3â in diameter; you will find that the suet has melted somewhat. Cover the cylinder with plastic wrap. Put it in the refrigerator for 24 hours. The following day proceed with filling and baking them. Remove the cylinder from the refrigerator. Cut the cylinders into slices the thickness of 1â. Another possibility is to take each 1â slice and sprinkle a little flour on a board and a little on the slice. With a rolling pin, roll from the center out to the right and the left. Again place the rolling pin in the middle of the oval and roll down forming an oval shape. Pick up the oval and fill with the filling in the middle. Seal the wide part of the oval and place on a cookie sheet covered with parchment paper. Hold the shell in the hollow of your hand, put a spoon full of filling inside the center; seal the edges, but donât pinch them together. Prepare all the sfogliatelle. Bake in a 400Âº F oven for 15 minutes. Brush with the lard and reduce the heat to 350Âº F and cook for another 15 minutes. Brush with an egg wash and cook for another 5-10 minutes at 250Âº F. When they are a beautifully golden in color, remove them from the oven. NOTE: The result is a satisfactory pastry, but it doesnât not compare to the bakery. A special machine is used in bakeries to form the pastry and this canât be effectively reproduced at home even when using a pasta machine. 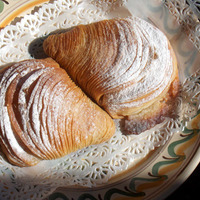 NOTE: Sfogliatelle do not stay well. It is best to make the dough and rolls the day before and the next day bake and serve them. NOTE: The preparation time does not include passive time. Patricia...congrats for succeeding at pastries which I love to buy at my favourite baker and would probably not make in my kitchen due to the complexity and patience involved. Wonderful photo of your accomplishment. Reminds me of Sunday dinners at nonna's house! Are you sure you're not my mother in disguise? We call these Lobster Tails over here. We split them down the center and add the filling..then ruffle some whipped cream over it....looks like a broiled rock lobster tail when we are finished. But of course its a pastry. This is the recipe Patricia... I wanted to refer back to your blog... on thanks! I'm glad you went back to my blog because I translated from Italian to English. The story behind this and the hotel link is also in the blog article. These are very difficult to make and is a long process. Now I know why you said they were hard to make. It came from a old cookbook of the chef's and even in this write-up it states that you can never get the same kind of results as a bakery. I give you credit for trying it. I did make a fairly good attempt at it and they tasted great. Claudia, I'm glad you went back to my blog because I translated from Italian to English. The story behind this and the hotel link is also in the blog article. These are very difficult to make and is a long process. Now I know why you said they were hard to make. It came from a old cookbook of the chef's and even in this write-up it states that you can never get the same kind of results as a bakery. I give you credit for trying it. I did make a fairly good attempt at it and they tasted great. wow, I've wondered how to make these. what a great recipe, these look absolutely delicious. Well these look fabulous, they call these lobster tails in NY. I have had the recipe a long long time and never attempted them. I am old school, have a pasta machine for 30 brand new in the box, just cant seem to teach myself these new things...wish we lived closer, I would love to watch you! these are perfect! I made them once and although it was fun and interesting to try, I think I'll stick to buying them. There is a video on YouTube showing how they are made by hand by a professional chef in Italy. I suggest you watch it if you make them. Filling them is about the same as in my post but they stretch out the dough which is interesting to watch. Most people don't have a surface where they can do this at home which is why I used the pasta machine and made them smaller, but you still can't get the pastry the same as by machine for this purpose. Good Luck in trying them, they are delicious even though they don't look as professional. Claudia, I made them once and although it was fun and interesting to try, I think I'll stick to buying them. There is a video on YouTube showing how they are made by hand by a professional chef in Italy. I suggest you watch it if you make them. Filling them is about the same as in my post but they stretch out the dough which is interesting to watch. Most people don't have a surface where they can do this at home which is why I used the pasta machine and made them smaller, but you still can't get the pastry the same as by machine for this purpose. Good Luck in trying them, they are delicious even though they don't look as professional.